Eucomis ‘Freckles’ sounds more like a health condition than a cool plant, but I can assure you when it grows on you there’s no need for a doctor’s visit. Mine was an impulse buy a few years ago and the fact it’s still with me should say something about its ease of growing. Dormant and dry in a frost free spot for the winter, plant outside when it gets warm. It forms a bulb, it likes it sunny, and it does just fine in regular garden soil. I don’t think anyone can accuse me of overcomplicating this post with over-the-top growing instructions but it really is that easy to grow. ‘Freckles’ is a hybrid version of the Eucomis species E. vandermerwei and as you might guess from the flower heads these plants are part of the group commonly referred to as pineapple lilies. I keep mine potted, but you don’t have to, they grow just fine in the open garden. ‘Freckles’ is a little on the small size and would likely get lost in the mess around here but someday the open garden might be worth a try, since rumor has it these are much hardier than you might think. Some reports even have them overwintering with no problem up into zone 6. So there you have it, a short and sweet Thursday’s feature. Kimberley at Cosmos and Cleome hosts each week and it’s always nice to focus on one of the plants making you happiest each week. The simplicity of this plant had me confused for a while. I couldn’t quite match it with anything until I finally just left it in its own pot. Like you said, pot with pretty foliage and that’s it! 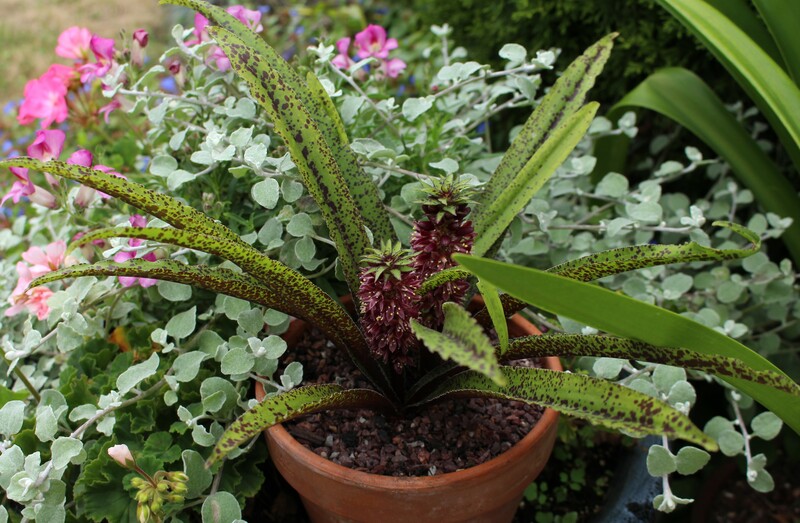 I have a few Eucomis and as you say, they are easy. I don’ t have Freckles, it is lovely. I never thought of growing them from seed, do they come true? When I visited gardens in Quebec, there was one garden where they wintered Eucomis in the ground. Quebec is USDA Zone 4 but they usually get deep snow cover before the ground freezes and snowmelt usually happens fast in the spring and the bulbs do just fine. Zone 4! Now that is unexpected, but as you said the snow cover is likely a big part of that. I expect that a thick mulch could do the same here, but I rarely get around to all the little things before it gets too cold, and a good thick mulch is hard to find in my sparsely forested garden. Oh how cute! I love that one! My mother-in-law has tried growing pineapple lilies up here (zone 6a), but sadly none have survived the winter so far. Cute is a perfect word since it’s so small an compact. With better care it will surely bulk up into a more respectable plant, but I was lucky it looks as good as this considering my on gain off again care. I’ll have to see which types are more hardy and less hardy. Usually the ‘Plant Delights’ website is a good rule of thumb. -btw I will hopefully be digging daffodils some day soon! Hmmm. I’m a little disappointed no one has ever gifted me a pineapple lily. I’m seriously thinking of trading in a few of my friends. This one is in full sun until about one and then it’s in the shadow of the house. I’ve had it in all day sun though and it seems just fine. Zone 4, huh?! But then I would have to wish for more snow than I want to deal with. If only I could get heavy snow cover on the garden and not the driveway or the roads. I have more pots than usual this summer so I need to be careful not to be seduced by a freckle-faced babe. Yes be careful with those pots. I’ve noticed more and more of them are filling with plants and they are already so beautiful without!